Less really is more… it’s a lesson I don’t think I’ll ever fully learn. For example, I often get flustered about what to make to post here. I’ll change my mind on my way to the grocery store and then change it another few times on my way home. This is a ridiculous (& expensive) habit because I end up buying way too much so I have options on hand to suit my indecisiveness. (Although, it all does get eaten eventually). Every now and then I come up with something out of nothing, and those almost always end up being my favorite recipes. This one came about one chili night when I didn’t feel like leaving the house. It’s largely a pantry meal, if you count the fact that sweet potatoes, shallots and garlic can be stored for quite a while. And, surprise, surprise, it’s a new favorite. I knew cashew cream and pureed sweet potatoes would be a winning (and warming) combo, but I thought I’d take it a step further by roasting the veggies first. The slightly smoky flavor is subtle but worth the extra step. The sauce is the star here, but feel free to add in whatever additional veggies you like. You better bet this would have been packed full of green stuff had it been more convenient at the time. But I can’t complain, this was the perfect plate of creamy comfy food all on it’s own. Peel the sweet potato and slice into quarters. Peel the shallots and slice in half. Leave the garlic in it's paper, and place the sweet potato and shallot pieces on a foil lined baking sheet. Toss it all with a drizzle of olive oil, salt and pepper. Roast, removing the garlic after the first 15 minutes. Roast until the sweet potatoes are tender and the shallots are browning around the edges, about 30 minutes. Remove from the oven and set aside to cool slightly. Meanwhile, cook your pasta until al dente, reserving some of the starchy pasta water. Drain your cashews and place them into a high speed blender with the sweet potato, shallots, (peeled) garlic, olive oil, balsamic, tomato paste, rosemary, and a few pinches of salt and pepper. Puree, adding water as needed to get the blade moving. Taste and adjust seasonings. In a large skillet (or a bowl) toss the cooked pasta with some of the sauce. 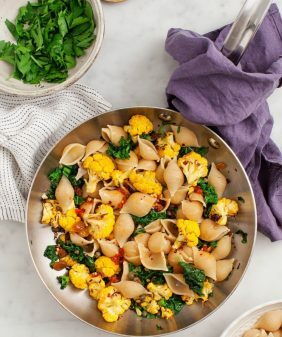 Add pasta water as needed to loosen, and add more sauce to your liking Add chopped chives, toasted pine nuts and a pinch of red pepper flakes. Taste and adjust seasonings and serve. Feel free to toss in more veggies... steamed spinach, kale or roasted broccoli would be all be delicious additions. Make ahead tip: store finished sauce in the fridge for up to 3 days. When you're ready to serve, boil pasta and toss it all together. For the smoothest sauce, a vitamix-like high powered blender is recommended. In a pinch, I can get away with soaking my cashews only 30 minutes. I am so intrigued by the combination of sweet potatoes and cashews–they are two of my favorite foods! I will definitely have to try this out sometime!! Can’t wait to try out this recipe! Do you have any substitution suggestions for the cashews if we have an allergy? Could almonds possibly work, or could you just omit the cashews? Hi Linda, you can use almonds, although they become a little smooth than the cashews so I usually look for peeled raw almonds (I find them in the bulk bins). They’ll also get creamier if you soak them overnight. The nuts give a rich creamy texture, if you leave them out it’ll be more of a sweet potato puree rather than a cream sauce… hope that helps! What about almond flour as a substitute? It’ll probably be too gritty – i would just stick to the cashews, I promise they’ll get the most creamy! i am in love with this recipe!! xox thanks for sharing. this looks absolutely delicious. i’m not vegan but man, vegan dishes like this are so good. I am the same way. Always, always changing my mind. It is terrible and I torture myself! LOL! The ones that just happen are always the best and my favorite too! 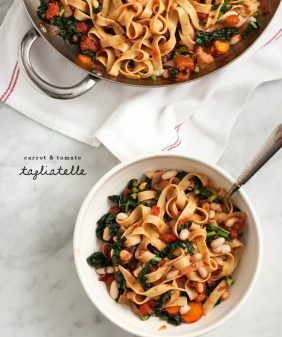 This pasta looks incredible and I love cashew cream! Too often I get indecisive about what to make, and then in the fleeting moments of making a grocery list, I end up pulling idea together from what’s already on-hand. I agree, sometimes simplicity works best, and figuring out new ways to turn just a handful of ingredients into something wonderful. Like this! 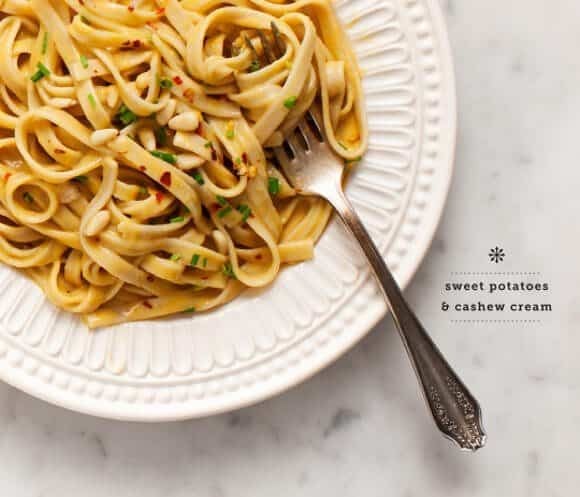 sounds very much like me here, I bought sweet potato a while ago wanting to make pot pie or something…but i am thinking to make this alfredo sauce. I love when dinner comes together with bare pantry. Wow!!! Very interesting and mouthwatering recipe. I happen to have sweet potato on hand, yay!!! This looks delicious and such a fitting meal for a cold winter evening. That is such a good idea to make a sauce out of cashew milk and sweet potatoes. Hi there – this looks so delicious! My mouth is watering just looking at the photos! Is it possible to use all natural (no salt, sugar, or oil) cashew butter instead of blending raw cashews as I don’t have a blender! I just made this, and it was amazing!! Definitely a new favorite. I added some smoked paprika to compliment the smokiness of the roasted veggies, and used sundried tomatoes rather than tomato paste. I love your recipes so much, and hope you never stop blogging! glad you liked it, you’re so sweet 🙂 I’d been planning on trying it with smoked paprika – you must have read my mind! What does it mean soak the cashews? What are they soaked in? This is awesome! Just made it with soba noodles. Can’t wait to try on veggies. Wow, this sweet potato cashew sauce is genius, and I can’t wait to try it after the holidays! I love brown rice pasta but have found it needs to be tossed with plenty of loose sauce since it absorbs a lot of liquid and can turn gummy quickly otherwise. So this looks like a perfect sauce for it! I made this tonight and loved it! It was such a nice sauce and I see myself making it over and over. Thank you! Made this last night and LOVED it! so glad! thanks for coming back to let me know! Just made this and it is so, so good! I ended up using spaghetti squash instead of noodles, and it still rocked. Will make again for sure. I’m not a wine expert, but I would do a red that’s a bit fruity – pinot noir, sangiovese, or even syrah. For white – a fruity chardonnay. 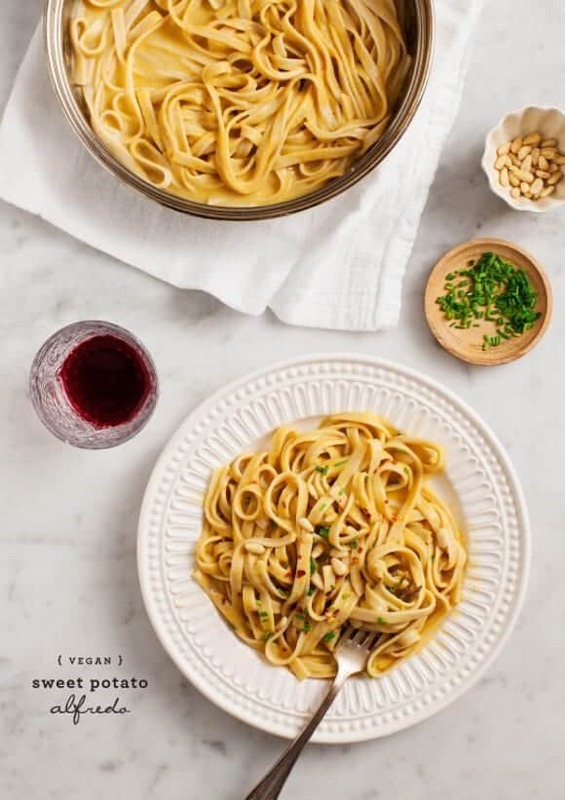 (the book What to Drink with What you Eat is a great resource for pairing food ingredients w/ wine – you might find it interesting to check out). I made this tonight and added red pepper flakes, as well as adding peas and sauteed red pepper to the pasta noodles (I used shells). YUM! I do wish I had a vitamix because it’s not as silky as yours but the flavors are still delicious. Thanks! I use a lot of your recipes when I cook, but I always forget to leave comments. This is one of my favourites, it is amazing! Thanks for sharing the recipe. In vegan cooking, what are cashews used to replace? 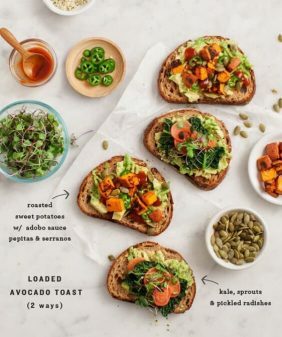 In this recipe, what are they replacing? blended up they turn into a creamy sauce – they’re used instead of cheese or heavy cream. I made this the other night and it was amazing! Followed the recipe exactly except instead of tomato paste I used some classic tomato sauce I had already open in the fridge. Also left out the chives and pepper flakes and instead topped with sun dried tomatoes and mixed in roasted cauliflower. So good! And we had a lot of sauce left over so we enjoyed it for a few lunches too. 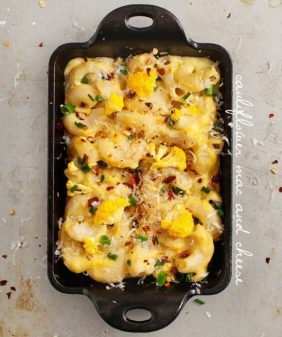 Thanks for being my favorite vegetarian/vegan food blog! I just made this for tonight’s dinner, I added 2 tbsp of veggie broth and 2 of almond milk, instead of water. It is soooooo delicious. Holy smokes. I can’t stop eating spoonfuls from my blender. Way to go. Hi Jenn – so glad you liked it! Wow! This was delicious! I am finding that I don’t miss cheese nearly as much anymore when I can make recipes like this one. It is so much more flavorful and I don’t feel so heavy and bloated afterwards. Thank you! I am no vegan. I like to consider myself an open minded carnivore that likes to eat anything and everything. But if I could cook all my meals that tasted this good, meat would not ever be needed. I was so impressed with this recipe. Skeptical at first but once I tasted the sauce after it came out of the food processor, I knew it was going to be amazing. I left out the chives and pine nuts and simply garnished with some fresh cut parsley and fresh cracked black pepper. Sooo good. I have a ton of sauce leftover too. Thinking about roasting some veggies and tossing them in the leftover sauce. Made this recipe last night and it was delicious! I used tomato sauce instead of paste and also used less water. And used toasted sunflower seeds instead of pine nuts. Also goes great with bread alone! Will make again! Can you freeze the sauce for future use? I haven’t tried freezing it – but I’m thinking the texture will probably change as it thaws – you might need to blend it again to make it creamy again. Is there an alternative nut I can use instead of cashews because I have a family member who is allergic to it. I love all your recipes btw! <3 Thank you! Hi Jaska, thanks! Try raw sunflower seeds. Full fat coconut milk (minus the water in this recipe), might also work although it would change the flavor slightly. Amazing and super yummy!! Can’t wait to try them at home! Hi Tally, yay, I’m so glad you loved this one! Can you recommend a couple possible subs for the balsamic vinegar? We love this recipe and I am out!! We have white wine vinegar and apple cider vinegar though. Any thoughts for subs would be so appreciated! Hi Rachel, I’d go for the white wine vinegar – it should work just fine! Hey Jeanine I just wanted to tell you that I just made this for dinner and it was divine!! I’m transitioning into a vegan diet and with delicious sauces like this one, who the hell needs dairy?! I added mushrooms to mine and it was better than the real thing. Thanks so much for sharing. 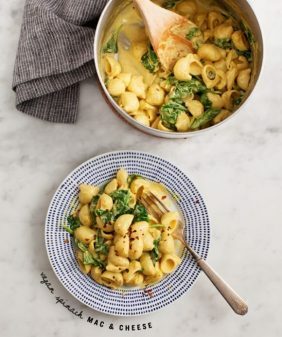 Do you usually use the sauce for anything other than pasta? Hi Becks, I’m so glad you loved it!! We LOVE this recipe! I have made it many times now. It totally feeds my craving for creamy pasta sauce and the flavors are wonderful. And my toddler loves it too! I was wondering what size your shallots are usually? Sometimes I get some that are the size of small onions, others as small as large garlic cloves! So what size shallots did you use here? Thanks! Hi Rachel – I’m so happy to hear that it’s become a family favorite! My shallots are usually the size of garlic cloves. Oh my! Hubby would love this! Pinning now! Thanks for sharing! LOVE it. Thank you! Mmmmmm…..yum. This looks totally amazing. I’m just starring at the screen looking at how delicious they look. I love cauliflower & cashew cream sauce (just made it for the umpteenth time)! 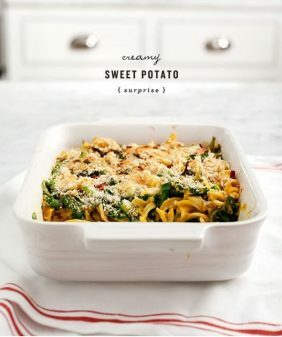 I cannot wait to try it with sweet potato. I find when I up the veggie and reduce the cashews, it can sit in the fridge for 4-5 days. My oven is out of commission so I’ve been trying to make a ton of meals on the stove. I’m going to steam my sweet potatoes, sautéed the other ingredients, and add a bit of zucchini to the mix. Thanks for the idea! I hope you like the sauce! This might sound like a stupid question, but should i use sweet potatoes or yams? The reason i asked is that most sweet potato recipes really mean yams. Thanks so much. Hi Kali, you can use either one interchangeably! I finally made this today. It was so delicious! I was a little nervous because I’m new to vegan cooking, but it was so easy. Served over brown jasmine rice. I will definitely make this again. Thanks so much. Hi Kali, I’m so glad you loved it! This is AMAZING. I added lots of red pepper flakes and chives. I didn’t use pinenuts as I’m reserving my small stash for a pesto pasta. The rosemary adds such a winter comfort layer. Very rich, not an everyday meal – although super simple to prepare.